Well, it’s finally happened. We’ve found a way to do fried chicken the Red’s way! It starts in our smokers, then gets coated and deep fried for a taste that gives an authentic classic a Red’s True Barbecue spin. 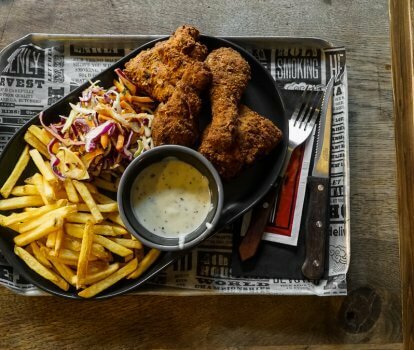 Served with fries, slaw and white gravy (a U.S. staple), this is a good one even as far as we are concerned. Come in and try it for yourself for only 12.95. But be quick… it’s only available until the end of November. Why did the chicken turn pink? One of the questions we get asked the most is about why our sticky chicken and smoked fried chicken can look pink on the inside. And it’s totally understandable – we’re brought up to believe that seeing pink in chicken means it’s undercooked. But that’s not the case with low and slow barbecue, we promise – click here to find out why!